Ko Lanta is very easy access from everywhere. She located around 70 Kms from Krabi Provience and around 90 kms north of Trang Provience. 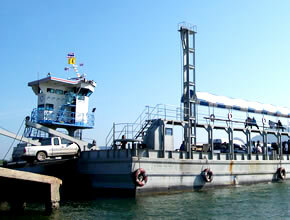 Ko Lanta can access by both ferry and private car. If you came by private car there are two car ferry need to accross. Both ferries will start at 7:00 am until to 22:00 pm everyday. Please check at Ko Lanta Map for driving detail. You can also use the vinivan service both from Trang or Krabi to Ko Lanta. You can check the minivan schedule and price in each route at left links. The most easy and convenience to get to Ko Lanta is by Public Ferry from Krabi and Ko Phi Phi. The schedule and price detail are at the left hand links. Ko Lanta Pier is very crowned with the new face tourist especially in the Peak season during Decemer to January.